Richmond: Looking for a positive outlet for your 13-18 year old daughter/ niece/ friend/ etc. ? Look no further. God’s Royal Daughters Day Camp is a one-day camp that strives to provide young girls with self-esteen, confidence, spirituality and other gems crucial to womanhood.“The teens will learn how to be a Godly young lady from A to Z,” says Kyia Hobson, Liberty University student and co-founder of the camp (along with her mother). The camp includes but isn’t limited to etiquette instruction, health and fitness education, skin care and make-up tips, abstinence education, modeling techniques, and much more! “My mom and I both have a heart for this generation and we want to train and push them into their destiny. My mother actually came up with the vision for this day camp. We wanted to do something that would train teens to be the girls that God called them to be by equipping them practically and spiritually,” Hobson says. Hobson has high hopes for the camp. “We hope the girls will receive everything that the team has poured out to them at God’s Royal Daughters’ Day Camp. The team has been carefully handpicked to meet the needs of the girls. We want each girl to be impacted. It is our goal that every girl in attendance leave changed, impacted, and transformed by Christ,” says Hobson. The world is FULL of its issues, especially for us females. As we all know, it is vital to cultivate young girls as soon as possible, so they have the tools to become the BEST women they can be and combat the pressures life presents. God’s Royal Daughters seems like a great step forward in a positive direction! 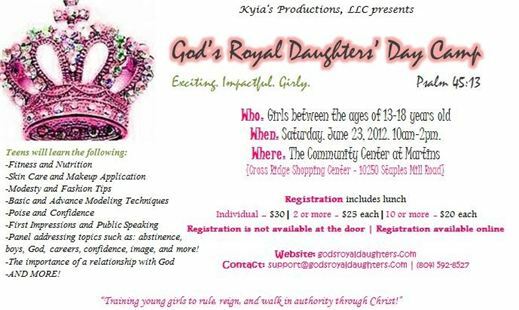 God’s Royal Daughter’s Day Camp will take place on June 23rd, 2012 from 10 a.m.- 2 p.m. at Martins’ Community Center at Cross Ridge on Staples Mill Road. The cost for one girl to attend is $30 (2 or more $25 each; 10 or more $20 each), including lunch. Register online at Godsroyaldaughters.com or by phone at 804-592-8527. Registration CLOSES on JUNE 21st. Call 804-592-8527 or email support@godsroyaldaughters.com for questions and concerns and check out Godsroyaldaughters.com for more information about the camp, its initiatives and its founders!